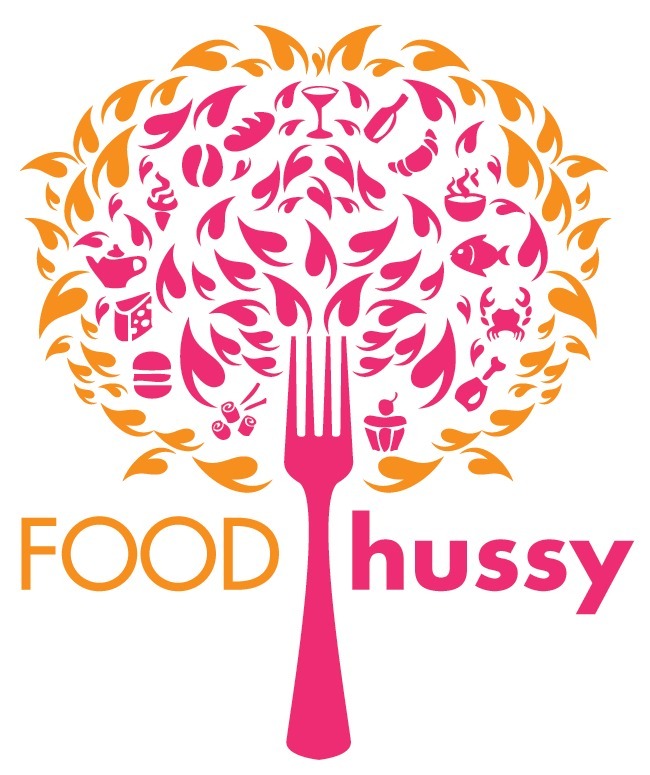 Recipe: Chocolate Peanut Butter Cereal Bars | The Food Hussy! So last week - I was a cooking fiend! I did some menu planning and decided to get started. I did really well - I made 4 of the 5 items I planned to. 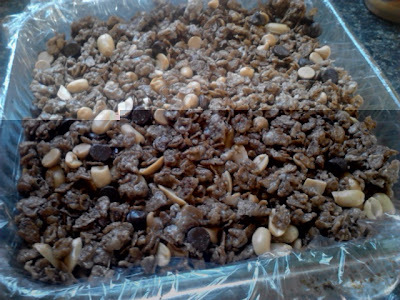 So first up - the Chocolate Peanut Butter Cereal Bars! I wasn't really sure if I would like these - since I don't like "rice krispie treats" so I decided to make half of the recipe (full recipe below). I got this recipe from the current issue of Everyday Food magazine. It starts easy enough with a bowl full of Cocoa-flavored rice cereal. I used Cocoa Pebbles because I had a coupon. 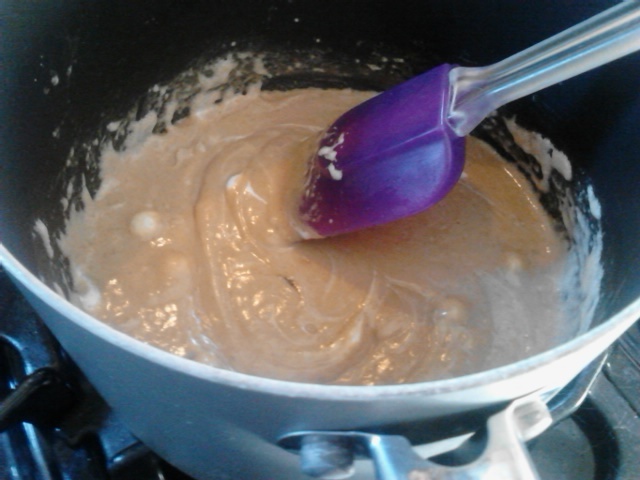 Then you melt mini-marshmallows and peanut butter in saucepan with a little butter. I was a petrified of this step. I was sure the marshmallows would stick to the pan - but they didn't at all! It was super easy and only took a few minutes. Then you pour the sticky mix into the cereal and stir it up. This is where I encountered a little issue - I cut the recipe in half but think I should have kept the sticky part at full recipe and the cocoa pebbles at half. 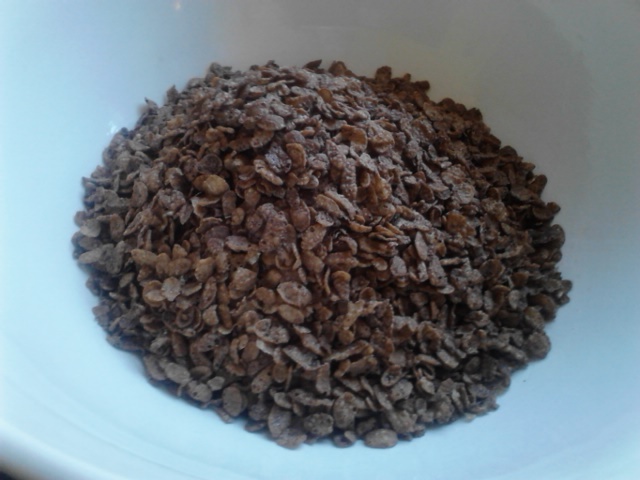 When I stirred these together - it was just some small clusters and lots of loose cocoa pebbles. 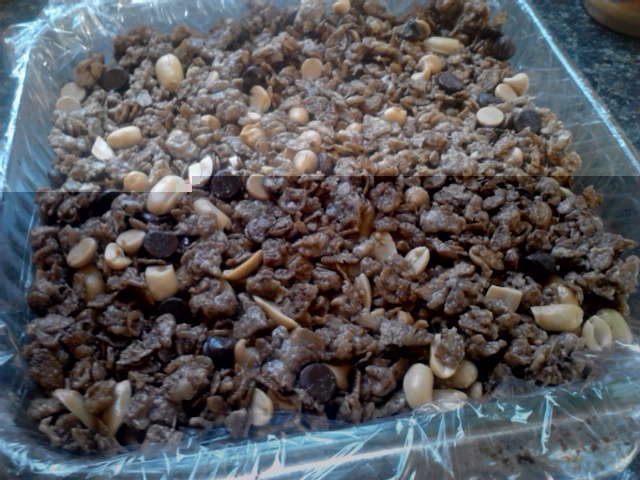 The recipe then calls for chocolate chips & peanuts to be stirred in. I also added peanut butter chips because they are my favorite. Then you pat the mixture into a dish - you were supposed to use parchment paper but I didn't have any so I made do with plastic wrap. I just didn't have enough of the sticky mix because I knew when I pushed it into the pan that I didn't have enough. Sure enough - it didn't hold together. But I made the best of the situation and just poured the mixture into a big ziploc bag. I'm using it as a snack mix - it's REALLY sweet - so I'm not sure if it's a cereal bar or a snack bar. But even with the lack of bar formation - it tastes really good. Like I said - it's VERY sweet and rich. I take the little snack bag size to work every day and munch on it mid-afternoon. 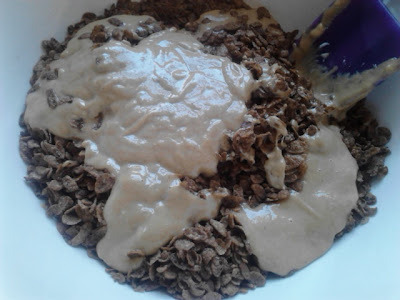 So here's the recipe as printed - I would recommend making more of the sticky mix or use less cocoa cereal.